large-scale outdoor performance that explores the significance of home and the importance of being part of a community. 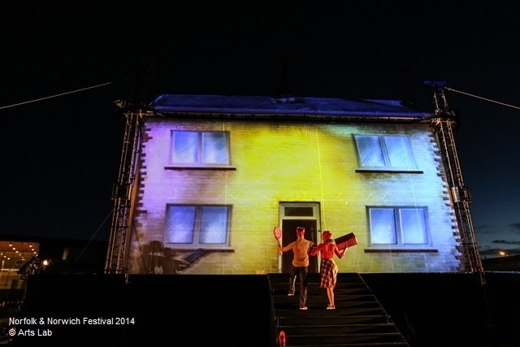 Using large-scale projections, the show starts with an exhilarating race through streets and neighbourhoods familiar to the audience, to this particular, mysterious house. A figure appears on the roof, climbs precariously onto the chimney and begins to share the house’s story. The audience is taken on a surreal and poetic journey as rooms, memories and characters are revealed: from the perfect couple moving into their ideal home, to a child who imagines her surroundings as an enchanted castle, a teenager desperate to escape and an old lady who can’t leave. Aerialists scale the walls and pound the streets as the house dramatically transforms into a variety of stunning visual backdrops. Finally, the home begins to crumble and a harried adult realises that it is time to stop running… SAFE HOUSE explores the emotional space that lies between HOUSE and HOME, and follows one person’s journey to find their home. A breath-taking finale combines aerial performance with an exhilarating quick frame animation of hundreds of photographs taken from local participants in a place they call home. Click on the link to see the story so far….